*Dates can be flexed to meet your needs. 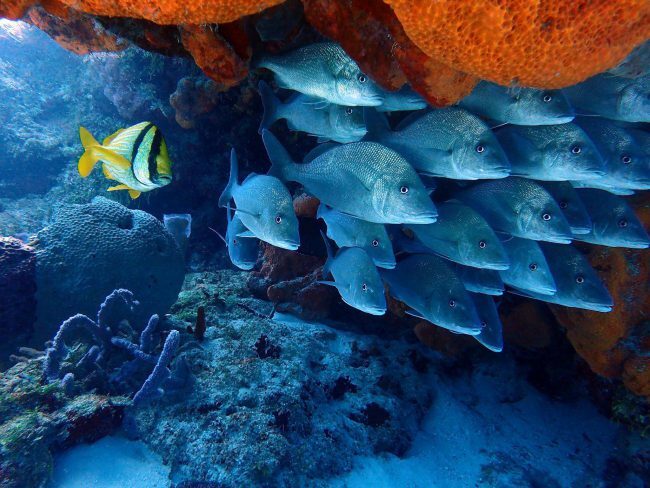 Turquoise water and walls with winding swim-throughs set the back-drop for the abundance of life that thrives around Cozumel’s current-swept Palancar Reef. A great way to shake off the winter blues, Cozumel is a dreamy vacation for divers and non-divers of all ages. We’ve been doing this trip for decades– and we know how to do it right! 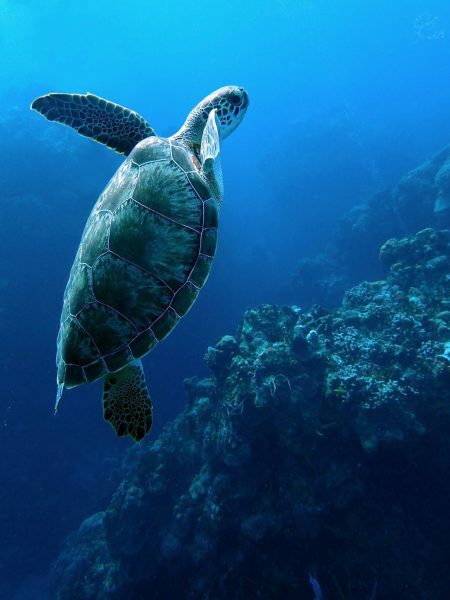 Enjoy the best diving in the Caribbean: reefs riddled with tunnels, decorated with huge elephant ear sponges and schools of silver glassy sweepers, nurse sharks, eagle rays, huge morays, and turtles. Don’t forget the endemic Cozumel Catfish, with its brilliant colored fins and a temper to match. If you didn’t get enough during our morning boat dives on Palancar Reef, grab a tank and jump back in after lunch. And after dinner. 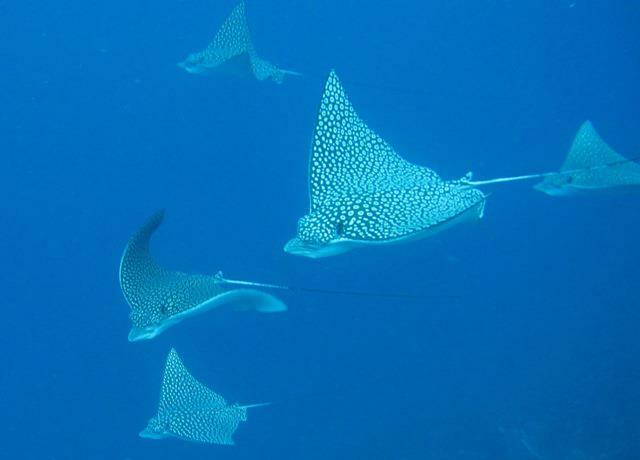 Find flying gurnards, eagle rays, octopus sea horses, red-lipped batfish, right from the hotel beach! 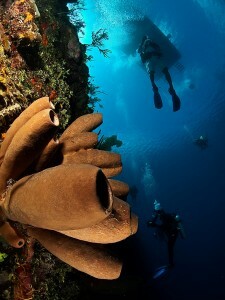 We can also arrange night dives off the boat or a trip to dive the local wreck. 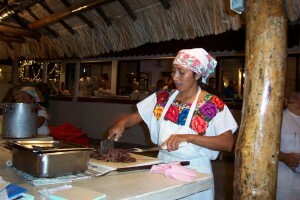 A special fiesta: fresh made tortillas and scrumptious Mexican dishes served on the beach for the pinata party! This year, we are going to be on the island for Carnaval – a week-long party with parades, floats, and costumes, culminating on Fat Tuesday. 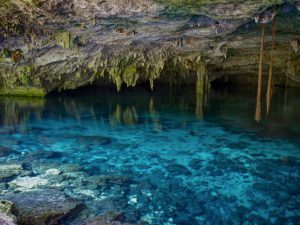 Cozumel is a great place for non-divers too, and all ages find something to love about this tiny Mexican island. Besides the lively “el centro” downtown, visit museums and art galleries, go golfing, explore Chankanaab Park, rent a jeep and drive to the beach, order a bucket of corona at a bar with a parrot and an iguana, visit the tequileria… Snorkelers are welcome on the dive boat, and can see all kinds of marine life in the shallow water off the resort. Hang out in a hammock and sip a Pina Colada. Swim in the pool. Snorkel off the dock. Read a novel on your balcony. Get a tan on the beach. Walk into town for a drink at Carlos n Charlies or to shop near the town square. The central square comes alive on Sunday nights when the residents of Cozumel and their children (dressed in Sunday finery) congregate in the town square to socialize, play music and dance. 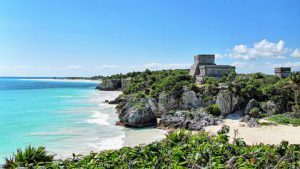 After the main trip, join us as we spend 2 days exploring the Yucatan peninsula – diving with Bull Sharks, trekking into the jungle to dip into the crystal clear waters of the cenotes, and taking in the incredible Mayan ruins at Tulum. Add in the white sand beaches of our resort… a perfect way to top-off an epic vacation! Great memories have been made over the past three decades in Cozumel with family and friends, and we always look forward to going back. 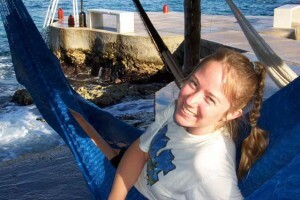 See pictures from past years in Cozumel on our website’s Photo Gallery. Scuba Club Cozumel is our favorite resort on the island, with balconied rooms and a little beach with palapas and hammocks to swing in the shade. The resort has its own pier; no need to get in a taxi and haul gear. Simply walk down to the dock after enjoying the restaurant’s huevos rancheros y jugo de pina! A minimum payment of $1000 is required to reserve your space on this trip. Balance is due January 15, 2019. Reservations and payments will be forfeited if full payment is not received. No refunds can be made after this date and all cancellations are subject to a $200 processing fee. Price is based on double occupancy and is subject to change at any time. These trips fill early so send your deposit today! We strongly encourage purchasing Divers Alert Network Trip Insurance. They off competitive rates, and your money goes to a fantastic program. Also, if you make the purchase through the link above, we get points towards DAN products. Thanks!